A perfectly roasted chicken is a thing of beauty. As a child I was not very fond of anything roasted. My grandmother took great pride in overcooking meat. The Thanksgiving turkey was roasted a day ahead of time, then sliced and put in a baking tray to further cook the morning of festivity. To say it was ´squeaky´ is an understatement. It snapped like brittle, burnt hair. The only way to eat it was to smother it in gravy. My mother didn’t go as far as my grandmother in overcooking roasts but she was always fearful of anything even slightly pink. As a result, steaks were cooked well done, roast beef was dry and hard, and chicken was dry. 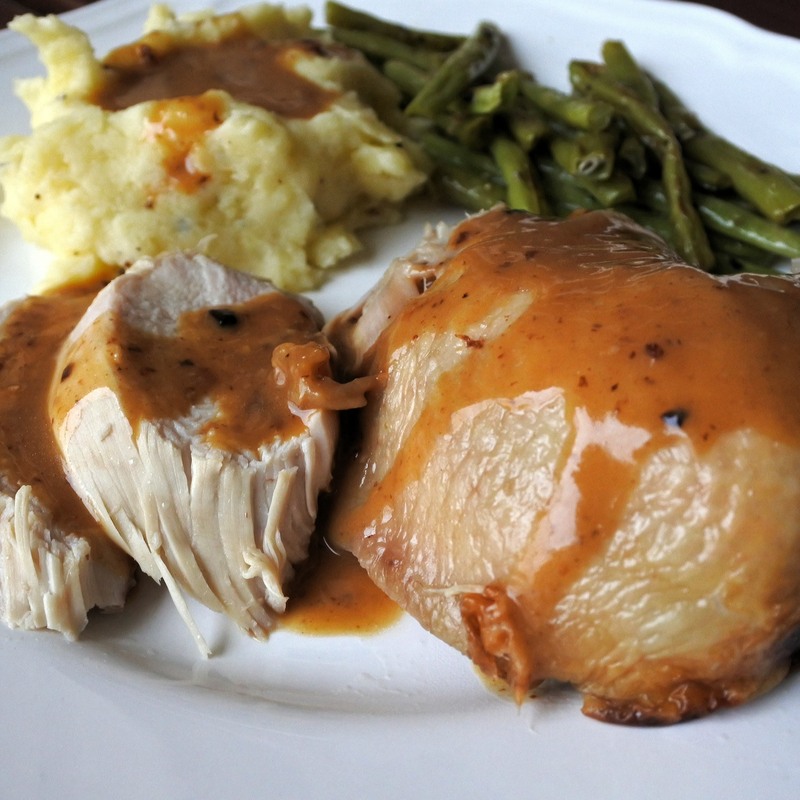 Once again, the only saving grace to any roasted meat was to smother it in a sauce or gravy. Don’t get wrong, both my grandmother and mother had dishes that they excelled in making, but roasting meats was never their talent. Up until 5 years ago I avoided anything roasted, always fearful of the squeaky meat. Then I started experimenting and researching just how to get the perfect roast and thankfully I’ve never looked back. Now roasts are a weekly tradition in our home and a favorite by all. Get a good bird: Factory farming is all about quantity (pumping out product to sell) and less about quality. As a result free range birds always taste better so if you can afford it, buy organic free-range birds. Take the time to brine: I’ve said it before and I’ll say it again, BRINE YOUR POULTRY. Not only does it add the additional flavors of whatever seasonings you soaked it in but it helps to keep the meat moist and juicy. Bring to room temperature before roasting: For even cooking, make sure to bring the bird to room temperature before roasting it. Flip it: This is an experiment that you don’t necessarily have to do. For the first 45 minutes of roasting, I cook the chicken upside down then carefully flip I upright for the remaining time. This helps the juices to drip down onto the breast as well as browns the underside of the chicken so if you are like me and hate flabby chicken skin, try this out. For crispy skin all over, cook upright over a bundt cake pan. Just make sure to adequately cover the center hole with aluminum foil to prevent the dripping from leaking down into the oven. Combine salt, sugar, thyme, rosemary, garlic, lemon zest, lemon juice, pepper and 1 liter of water in a large pot. Bring to a boil and let boil for 5-10 minutes in order to infuse all the ingredients into the brine. Once cool, add 2 liters of water and mix together. The brine should taste like salty soup (salty but edible). If you think it is too salty, add a little water to dilute. Add the whole chicken and brine overnight or up to 2 days. The longer it sits, the saltier it’ll become so don’t let it sit for too long. Brine the chicken in a large pot overnight. An hour or so before roasting, remove chicken and remove any debris sticking to the bird. Let warm to room temperature. Place in a large baking tray and brush with butter. When finished roasting, remove chicken carefully to a serving plate and let rest for 15 minutes. You can cover it in foil in order to avoid letting it lose too much heat. Add to a medium saucepan and heat over medium heat. Mixture should be hot but not bubbling. Remove from heat and let rest for a minute or two. Whisk together 2 egg yolks with 2 tbsp of fresh lemon. Slowly add roasting juices to egg yolk/lemon juice mixture a little at a time, whisking as you go so as not to curdle. If sauce is a little thin, slowly heat on low flame and whisk until it becomes a thicker gravy. Thanks. It was so juicy that it soaked the cutting board and kitchen island.